"A data structure that consists of a list of records such that records are added at one end and removed from the other." The queue is also available at Delicious and via a web feed. Fare Enough: Dallas...a transit light onto the nation? I have started collecting quotes from my favorite science fiction authors/works that include the word so. Eventually I will combine them into a tattoo design, with placement as yet undetermined. Star Wars — original trilogy preferred, natch. Allowing Tolkien's masterpiece even though it falls outside the science fiction genre. The radio program Marketplace from American Public Media has given me an idea for a fun and creative way of supporting the (visual) arts in Austin. I'm looking to connect with people in the field to get feedback and hash out some ideas. Any takers? Apple posted a — not surprisingly — well-written essay attributed to Steve Jobs on Apple's stance on Adobe Flash that made the rounds in my department at work a few days ago. Job's missive adds a (confirming) stamp of reason regarding his company's decision to not allow Flash on Touch OS — intentionally refusing to use the official name of the OS here — devices. And, what a perfect closer: "Perhaps Adobe should focus more on creating great HTML5 tools for the future, and less on criticizing Apple for leaving the past behind." The thrust of this stance, as I read it: Apple remains fearlessly innovative, enough so to challenge a giant in their field (and mine) on their homepage. So long as this remains the case, I intend to continue supporting the company out of Cupertino with my wallet. I shared the following tribute — along with many tears — at Curtis' memorial service today. Growing up, Curtis had mighty big shoes to fill. Up until recently I had convinced myself that I wore a size 15. Turns out this was an exaggeration that I now recognize as a testament to the footprint of my oldest brother. The expansive void left in all of our hearts is no exaggeration. We have suffered an immeasurable loss, that of our “gentle giant”. As a younger brother, I remember both the gentle and the giant. He roughed me up almost every day we spent together. Dad was often concerned that he had gone too far. Often, he had. But, at the end of these days, we always restored our friendship. He would have me listen to his recently purchased albums until I could barely keep my eyes open. After I finally managed to break away to go to sleep, one of us would knock on our shared bedroom wall and the other always knocked back. This, like our roughhousing, was another way in which we showed our love. A few days ago, I walked passed many of the haunts of our shared childhood. At the time he had the driver's license, so these were places representative of Curtis' passions — such as art and music. Instead of feeling the pains that each one of us has felt during the last couple of days, I found myself in good spirits remembering the creativity that he expressed with paint and with the guitar. He will not put a brush to canvas again. He will not strum another note. The precious moments we shared, though, carry on in my heart. I offer a gentle and giant reminder: until the end, Curtis never held back his love — do the same. 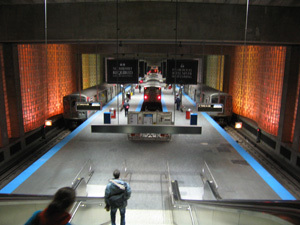 My new favorite place that I've never been is CTA's O'Hare Station on the Blue Line in Chicago, Illinois. If ever I'm at at the O'Hare International Airport in the future, even if only for a layover, I'll make sure to check the place out. Hopefully reality will do my imagination justice. Photo by Tom Harpel on Flickr.